Gummy candy is popular at Halloween and Easter, so why shouldn’t it be at Valentine’s Day too? 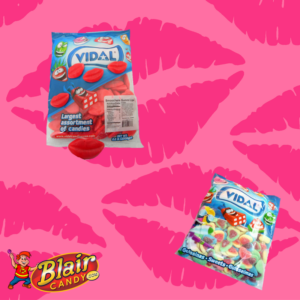 Blair Candy has quite a few Valentine’s Gummies to add to the holiday. Send a smooch with these gummy lips! Their strawberry flavor makes this a delicious treat to give to your Valentine. Or, try the gummy hearts! They’re super colorful and cherry flavored, making them fun for a candy dish or a candy buffet. Or, if you just want to go simple, these gummy melon rings are not only perfect for Valentine’s Day, but also as a gummy candy to snack on year-round. No matter what the holiday is, we have the gummy candies that you need! Shop BlairCandy.com today for fun, tasty gummy treats!